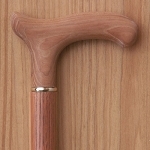 The Walking Cane Company has been manufacturing Hickory wood walking canes since 1999. 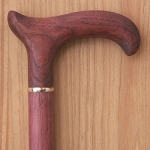 Hickory wood has been used for many years to make tool handles, wagon wheels, furniture and now walking canes. 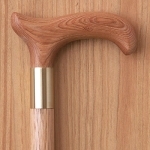 Pound for pound hickory wood is as strong as wood you will ever find. 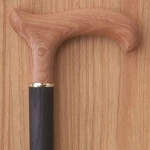 Available in four colors natural, medium walnut, cherry and black stain, two handle styles derby and fritz. 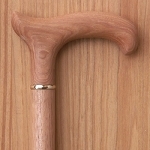 Comes standard with a brass deco ring, other options include a silver plated ring and Monte Carlo ring. 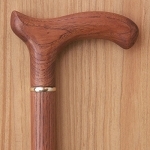 Very durable and strong the hickory wood walking cane should support up to 300 pounds when used properly. 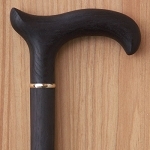 If you don’t see what you want we will gladly build you a custom walking cane to your specifications, please call us and discuss what you need. 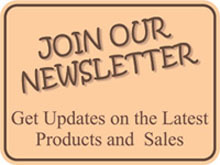 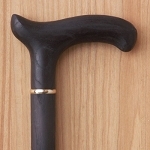 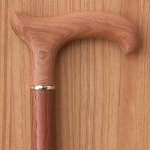 Note: The walking canes in this series are hand made one at a time when ordered and can require up to 3-14 days to ship. 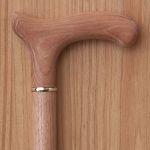 Because of this we can also customize these canes to fit your specific need such-as engraved initials, mix and match wood types, wider handles, stronger canes, request special wood and so on. 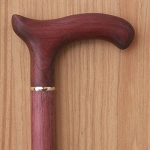 Feel free to call us for further options you would like on your walking cane.